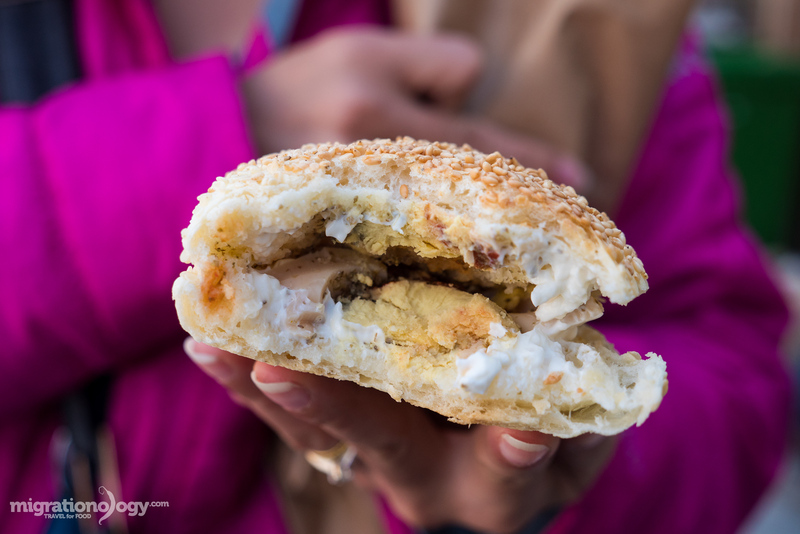 …In every direction within about a 500 meter radius, you’ll see people walking down the sidewalk, or driving in their cars, their faces stuffed into crusty sesame bread sandwiches. 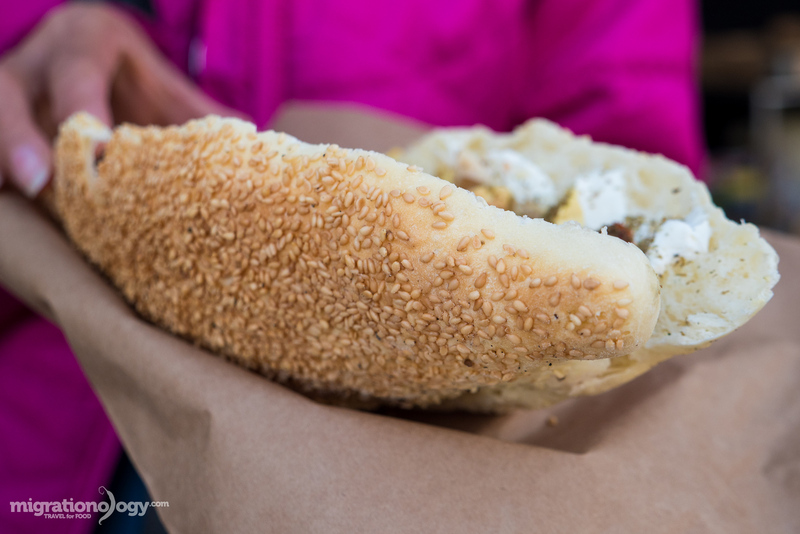 And you’ll know immediately, they just bought a fresh piece of sesame bread, filled with baked eggs, cheese, and za’atar from one of the most well known and one of the best bakeries in all of Amman: Salaheddin Bakery. When you’re in Amman, this is a bakery you don’t want to miss. Not only known for baking one of the best kaek (also spelled at ka3ek or ka’ek) sesame buns in all of Amman, but Salaheddin Bakery is also one of the oldest and most popular bakeries in the city. I didn’t really have any plans to do anything else on my final day in Amman. But I knew with certainty that I needed to make a stop at the famous Salaheddin Bakery for a taste of their sesame bread sandwich. Luckily, the bakery was located just a short distance from the hotel in Amman that I was staying at, so just walking down a few flights of stairs, to get to the valley below, located along the main road, in the Abdali Neighborhood, and I arrived. Again, as I was walking to the bakery, I saw so many people in their cars eating the sesame bread and it only built upon my anticipation. The big blue sign, the crowd of people standing outside, and the car parking lot – that actually wasn’t a parking lot at all, but just the far right lane turned into a parking lot because so many cars were stopping – made Salaheddin Bakery pretty easy to find. 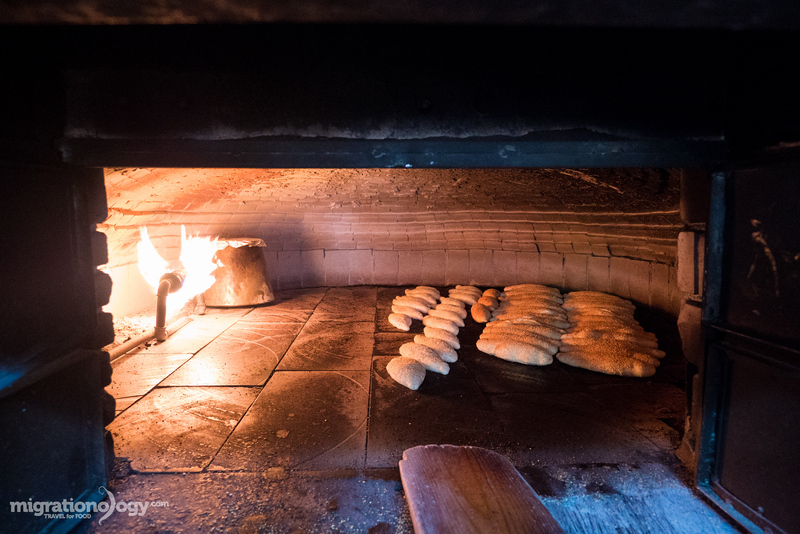 The door was open and as soon as I stepped inside the aroma of fresh baked bread completely overwhelmed me to the point where it would have actually been impossible not to eat bread when stepping inside. Everything at Salaheddin Bakery is do it yourself. You walk in, and almost certainly it will be pretty packed, especially dominated by males. And towards the back is where all the bread is being baked. There’s only one type of bread, a kaek sesame loaf, and while kaek can sometimes be in bagel shape, this is in a mini loaf shape. As soon as a batch of fresh bread is ready, it’s removed from the brick over, and a paddle full of hot fresh bread is tossed into a wooden box, ready to be consumed. At this point, you and a bunch of others will start grabbing bread – be a little aggressive. You can then proceed to go over to one of the counters, slice open your piping hot sesame encrusted loaf, and add in whatever you see on the counter top. There were a few trays of baked eggs, baked in the same clay oven. And then there were rounds of Happy Cow like cheese, though a different brand, a bowl of chili sauce and salt, and finally a monstrous basin full of za’atar. From what I noticed, there was no queue system, you just kind of reach around others, grab, and make your own sandwich. 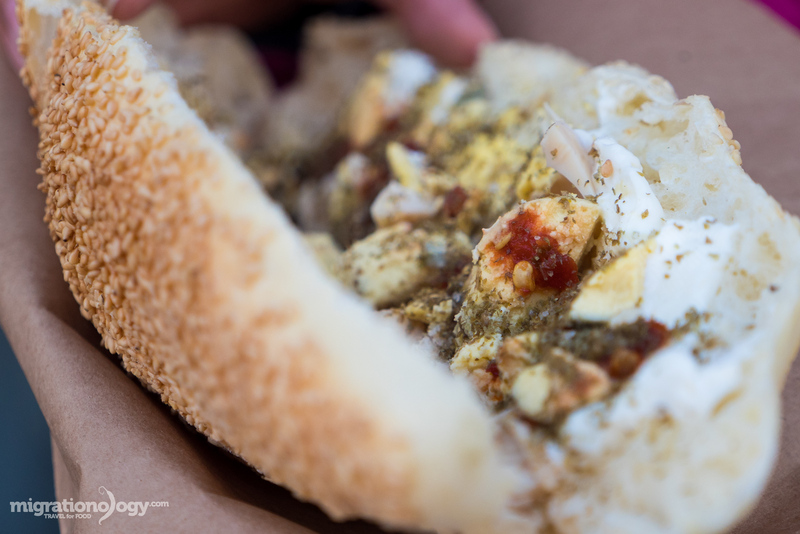 Everyone is friendly, but at the same time, everyone hardly can wait to dress up their kaek sandwich, sprinkle it full of za’atar, and take their first bite. When you’re done preparing your sandwich, you can then grab a paper bag, pay at the front near the door, and either take it to go, or just stand either outside or along the indoor counter and devour. It’s an indoor street food environment, and it’s fantastic. I loved every moment of being within the action of the bakery. For my kaek sesame sandwich I sliced it in half, added 2 triangles of cheese, 1 hard baked egg, chili sauce, a sprinkle of salt, and a few pinches of za’atar. Had I not already eaten 2 eggs for breakfast at my hotel a couple hours previously, I would have definitely gone with 2 eggs. It was all about those sesame seeds! Ying and I headed outside the door, to take our first bite of the famous bread. 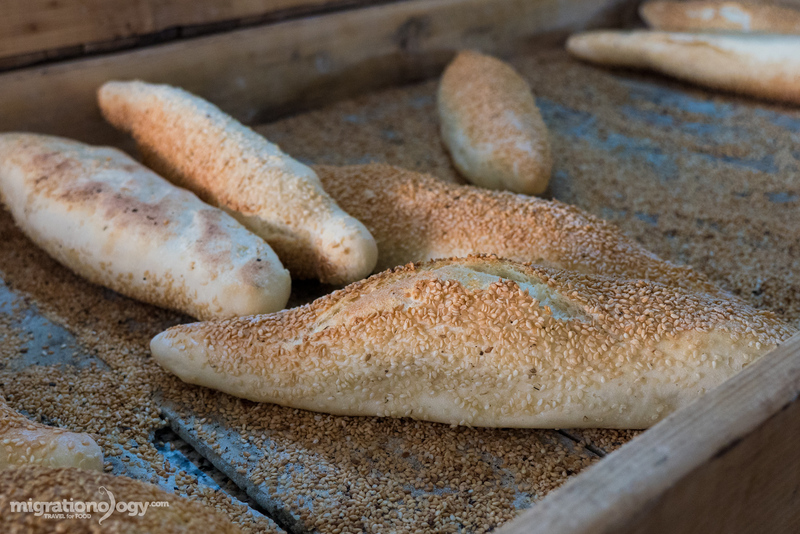 As soon as I took my very first bite, I knew exactly why everyone was at Salaheddin Bakery and why so many consider it the best bakery in Amman: It was all about the bread. The inside was hot and fluffy, while the outside was perfectly crusty, and fragrant from the layer of crispy toasted sesame seeds on top. It was one of those loaves of bread where, when you take a bite, the bread collapses in your mouth with the combination of crust and fluffiness, and still piping hot right out of the oven. All the inside ingredients, the hard baked egg, the cheese that tasted similar to cream cheese (and reminded me of my childhood when I used to love that type of Happy Cow cheese), and the za’atar, were all good, and complemented the bread wonderfully, but it was really all about that bread. The bread was simple perfection. You’ll need to watch the video to see how it all unfolded… but as the kind owners of Salaheddin Bakery saw me taking photos, they invited me into the kitchen and gave me a tour of the inside of the bakery. They also showed me how they prepared the dough and rolled each loaf in a trough of sesame seeds before putting each loaf into the oven to bake. 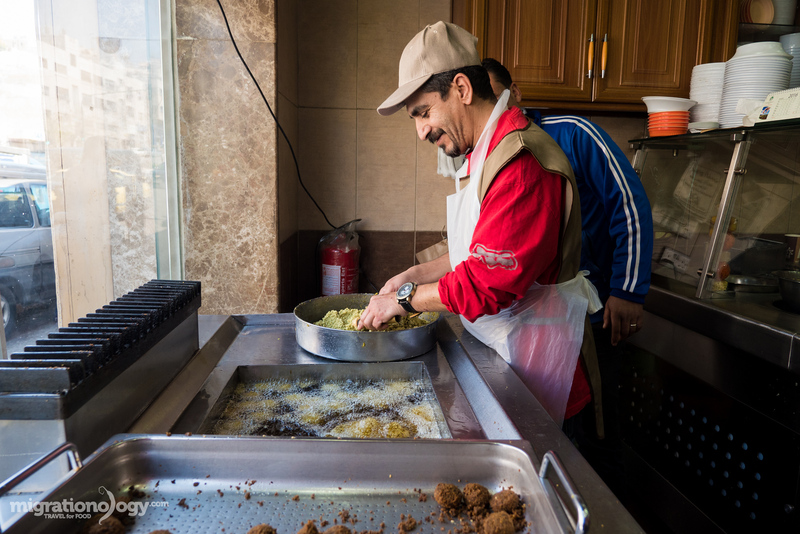 Right next to the bread bakery, and still part of Salaheddin Bakery, they also have a restaurant serving an array of dishes like ful medames, falafel, and hummus. They also have an Arabic sweets shop. The owners gave me a few snacks to try, including something called a barazek, a type of sesame cookie. It had a similar taste to a graham cracker, but again, topped in a layer of crispy sesame seeds. During my trip to Jordan I experience so much generosity and hospitality. 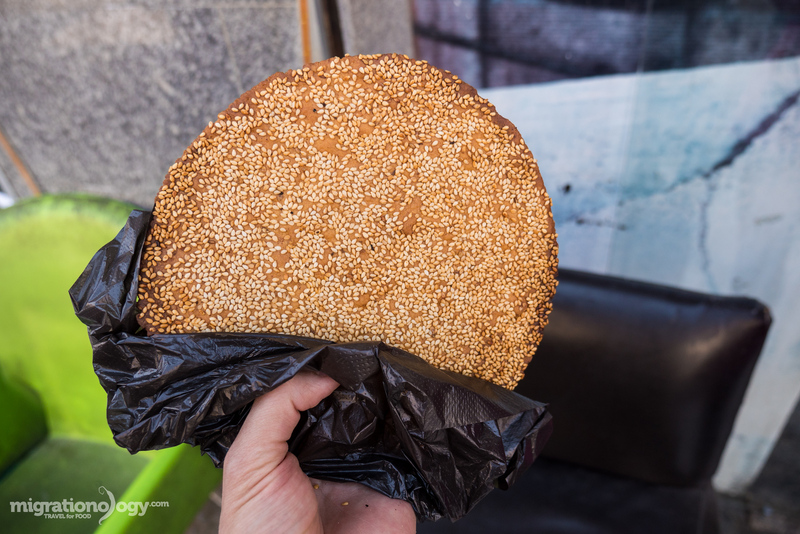 And eating the simple kaek sesame sandwich at Salaheddin Bakery, and being the recipient of the generous owners on my final day in Amman, was a truly memorable and lasting experience I had in Jordan. To get a full sense of this bakery watch the full video now. Or you can watch it on YouTube here. 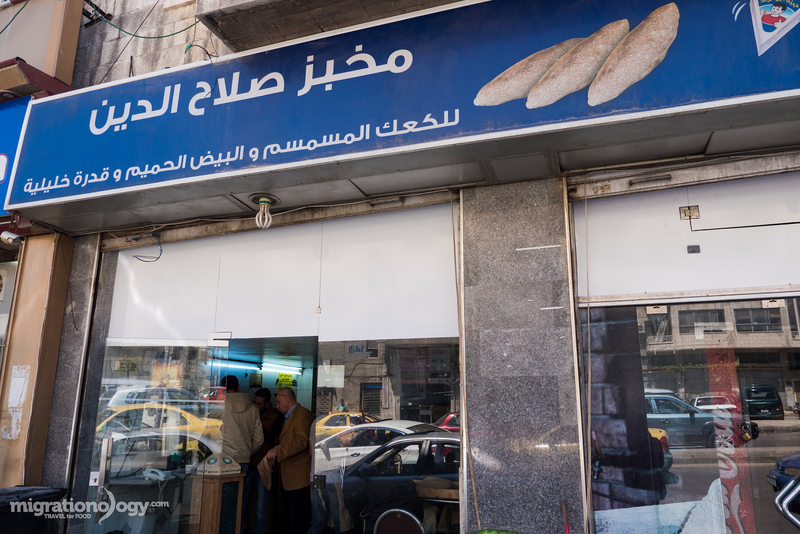 Salaheddin Bakery is one of the oldest and most famous bakeries in Amman, Jordan. 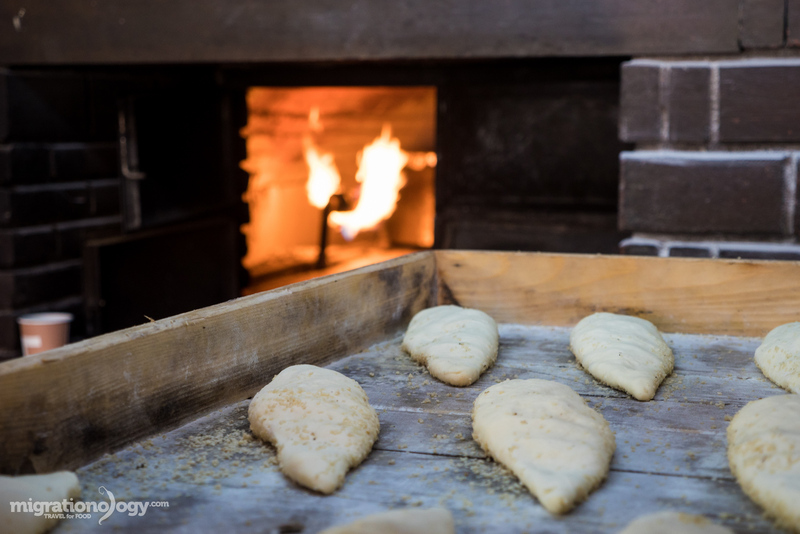 Along with having a full restaurant and Arabic sweets shop, by far the majority of their customers come to enjoy a freshly baked crusty loaf of kaek sesame bread, filled with baked eggs, cheese, and za’atar. It’s all self service, you grab a loaf of bread, add in whatever you want that’s available on the counter, and pay for what you added. 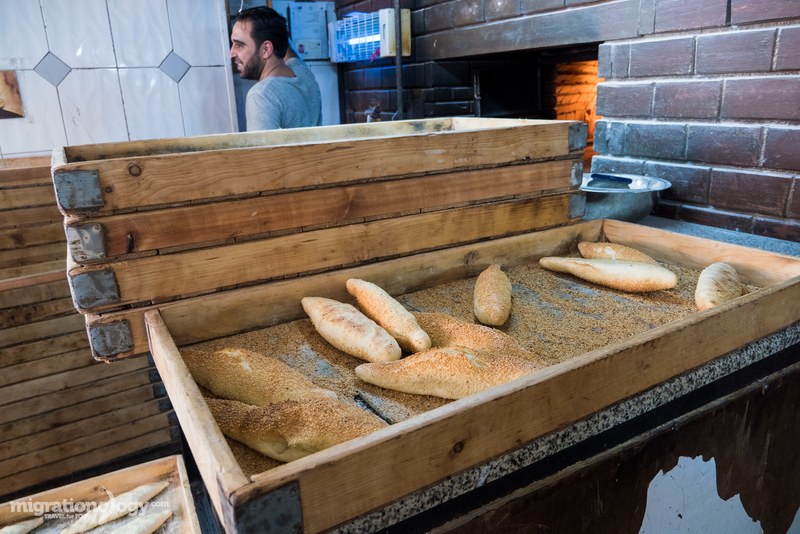 When you take your first bite, you’ll know exactly why so many others have congregated around this little delicious Amman bakery institution: the bread. 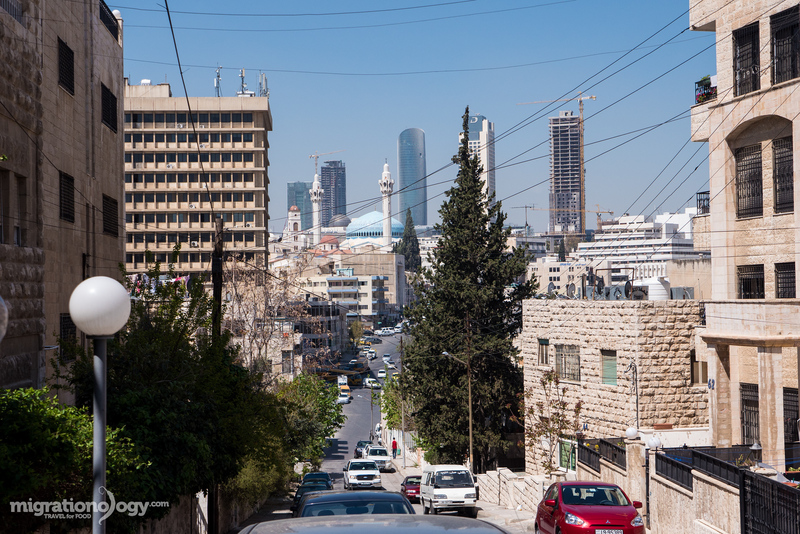 Also check out my Amman travel guide for more travel and food tips. Address: The bakery is at the crossroads of King Al-Husseim Street and Umayah Bin Abd Shams Street, not far from downtown Amman. 19 comments. I'd love to hear from you! My family just moved to Amman, and that is DEFINITELY on my list. Great video. Hey Steve, great to hear that. Hope you can visit this place soon. One of my fave episodes because…oh my gawd…that bread! Does anyone have a recipe? I’ve seen a couple online but it doesn’t look exactly like what Mark had. Hey Mark,i just wanted to say that you have a great Jordanian blog/vlog series, I’ve watched the entire Amman series and it looks like you had great fun. I will be traveling to Amman this summer and hope to go to some of the places you showed in your videos. Keep up the great content! Amazing post, the video is really interesting! Good post, the video is really interesting! You have made my day. You & Ying are tops for Jordan. Welcome back. Thank you very much VT! Mark, based on your experience while in Jordan, how likely you will visit it again? but for most Jordanian . taste better than dry one . The Good : za’atar & Sesame seeds . The Bad :- high processed white flour most likely from a GMO field . – Too much Salt . – The so called cheese , Happy Cow was heavily used when I was in Jordan . Most likely high processed cheap oil . The Ugly : It may sound like it’s not that expensive for someone from the USA or Canada , but from most Jordanian , salaries are a lot a lot lower than salaries in the west . – Fresh Figs taste better that dry one . – best fruit to try when in season .Things like : Figs , Mulberry , Pomegranate . 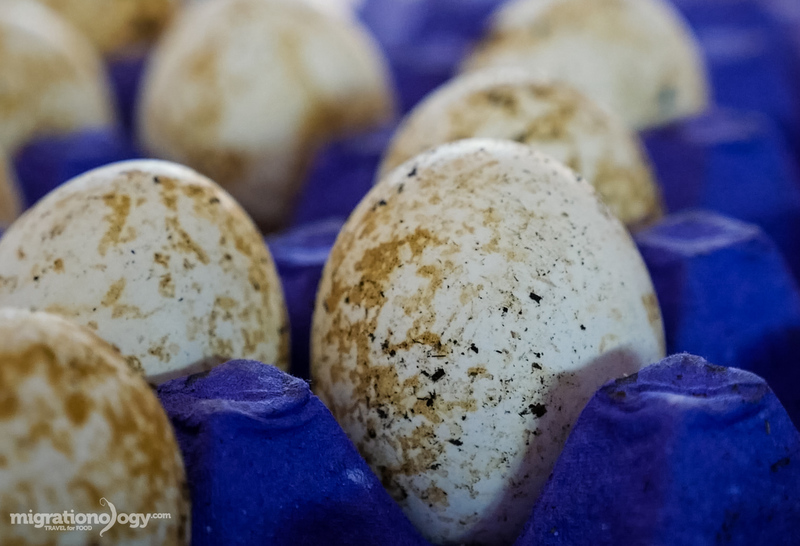 Regarding Eggs : You can check the facts @ >>>> nutritionfacts DOT org . Thanks for the input Former Jordanian. Thank you Izy, the sesame seeds are what really made it amazing. Awesome Blog Mark. The food looks delicious!